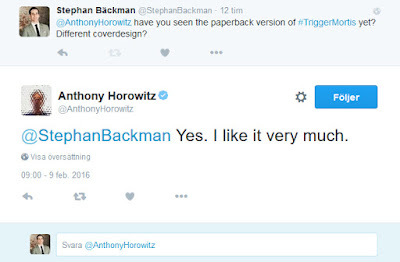 As a James Bond book collector it is hard for me to wait to see the paperback cover design for TRIGGER MORTIS until it will be released on May 19 2016. 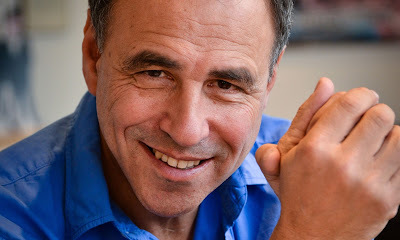 So I decided to ask Anthony Horowitz knowing that he has answered my questions before and the answer I got back makes me think we will be in for a treat (positive thinking). 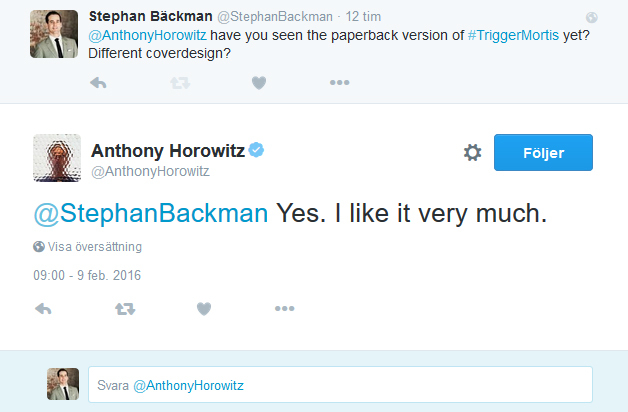 @AnthonyHorowitz have you seen the paperback version of #TriggerMortis yet? Different coverdesign? @StephanBackman Yes. I like it very much. Since I work in the film industry during the day I will try to get in contact with Orion Publishing and try to persuade them to let this blog have a 24 hour world exclusive on the cover design for Trigger Mortis. 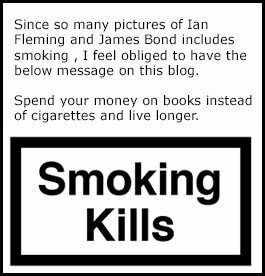 I do know that it is boldly to try and make this happen but this blog has only been around since October last year and thanks to you, the readers and fans of James Bond, it has already past 14 500 page impressions. In the movie industry we work like that all the time giving one site exclusive content for 24 hours. Both parties benefit from it. Lets hope for the best. I am so anxious to show the fans the cover as soon as possible. If you have not bought TRIGGER MORTIS on Hardback yet you can now do it for as little as £7 by clicking the link below.